Renowned cruise liner the Queen Elizabeth 2 is set to be converted into a floating luxury hotel and moved to Asia, its owners have confirmed. Regular cruise travel insurance customers may have been keeping tabs on the plans for the QE2 with some interest, as the proposals have taken various twists and turns since the ship was docked in Dubai after being bought by state investment company Istithmar World in 2007. That deal took place when Dubai's boom was at its peak, but subsequent events have left the vessel's future cloaked in doubt. Proposals were announced last July for the QE2 to be retained in the city-state as a hotel and form part of a maritime complex. The latest statement issued on Thursday by officials in Dubai does not specify the ship's planned destination in Asia. However, there is a map on display at the port which depicts the QE2 making a voyage to China. 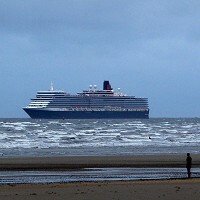 Checks will be undertaken on the QE2 in Dubai, the statement added, before the ship is converted into a 500-room hotel.